With the 50-point target safely passed and a week off ahead due to an international break attention is turning to next season for Leeds United and particularly the future of head coach Neil Redfearn. After the midweek win at Fulham and draw at Blackpool the Whites can confidently begin planning for another campaign in the Championship now and their first priority must be to determine who will be in charge. Redfearn would certainly be the fans’ choice to continue the rebuilding job at Elland Road and he must be given great credit for stabilising the club after the upheaveal of two failed head coach appointmnents. His assessment after the Christmas defeats to Wigan and Derby that Leeds were in a relegation struggle and would have to play a more realistic brand of football than they were attempting was bang on. Make no mistake this was a club in danger of sleepwalking its way to relegation, but results in 2015 have been nothing short of a revelation with United actually showing play-off form. They will not make the play-offs this year, but with seven matches remaining they are clear of trouble with 52 points and can top last year’s total if they can collect another 10. 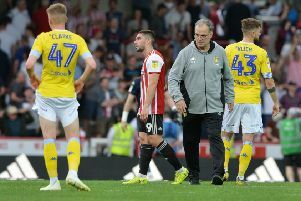 Redfearn has spoken of maybe a top 10 finish, which he would have been laughed at for suggesting back at the start of 2015, but this is now a realistic target, such has been Leeds’ progress. He remains in the dark, however, about whether his job as head coach will extend beyond the end of the current campaign. The ongoing doubts about when or if Massimo Cellino returns after his ownership ban does not help clarify Redfearn’s position, but questions are being asked now about his future role at the club. Redfearn has admitted that he has been asked to put forward suggestions for possible transfer targets and pre-season opponents, which is a nod towards him still being in charge come next August, but the sillence from the boardroom on the head coach position has been deafening. Perhaps the current week off gives the club a chance to properly assess the situation. Not everyone is having time off this week with talented young midfielders Alex Mowatt and Lewis Cook called up by England under 20s and under 19s respectively. Redfearn is delighted at the recognition for two of his best performers this season, but hopes they will not be over-used with the under 20s playing two friendlies and the under 19s playing three European Championship qualifiers in France. He said: “They’re important to us. They’ve played most of the games this season and it’s a tough campaign. It takes it out of you physically and mentally. Redfearn, meanwhile, praised his goal scorer in the 1-1 draw at Blackpool, Mirco Antenucci, who also came off the bench to score at Fulham.